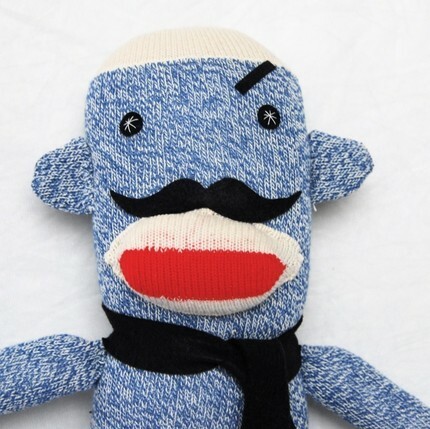 I love this Mischievous Mustache Monkey, "he measures 18 inches tall, but is larger than life"! As a child my only trick was that I could raise one eyebrow at a time and then gradually I was able to raise them each in succession at greater speeds. To this day I still love eyebrows and all the expression that they convey. I think this little guy would be a great gift for kiddos as their first lesson in sarcasm, and suspicion. If you can win over this monkey then you are skilled in the art of conversation. On another sock monkey note, I still love this commercial...maybe mischievous monkey needs a Mom tattoo too. That is one of my favorite commercials of all time. The simple things in life are so funny to me.